This Friday is International Women’s Day—what a way to kick off Spring Break! (My apologies to those non-students who don’t have a week-long break coming up). International Women’s Day has been observed since the early 1900s and is now an official holiday in Afghanistan, Armenia, Azerbaijan, Belarus, Burkina Faso, Cambodia, China (for women only), Cuba, Georgia, Guinea-Bissau, Eritrea, Kazakhstan, Kyrgyzstan, Laos, Madagascar (for women only), Moldova, Mongolia, Montenegro, Nepal (for women only), Russia, Tajikistan, Turkmenistan, Uganda, Ukraine, Uzbekistan, Vietnam and Zambia. The tradition sees men honoring their mothers, wives, girlfriends, colleagues, etc with flowers and small gifts. In some countries IWD has the equivalent status of Mother’s Day where children give small presents to their mothers and grandmothers. And since the IWD’s roots in the 1900s, many great strides have been made—from the big, obvious changes like the right to vote and a woman’s right to choose, to smaller, but no less important changes, like seeing more women in the board room, in the media, and generally in roles that can lend themselves to being a great role model for young girls. However, there is still a lot to accomplish, so IWD encourages women everywhere to celebrate what we have gained, but not lose sight of what we still need to achieve. In 1871, Gage and a group of 9 other women attempted to vote, and when they were denied, she argued with the polling officials on behalf of each woman, and in 1873 defended Susan B. Anthony when Anthon was placed on trial for voting in the election. In 1884, Gage was an Elector-At-Large for the Equal Rights Party. She also founded the Women’s National Liberal Union, and in 1893 she published Woman, Church and State, a book which outlined the variety of ways in which Christianity had oppressed women and reinforced patriarchal systems. 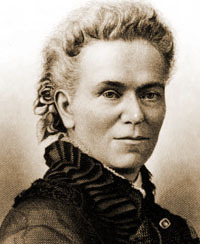 This trip is particularly exciting to me, since though I’ve dedicated a great deal of my time here at UR to Women’s Studies, I know very little about Matilda Joslyn Gage, but she seems like a fascinating figure in the feminist movement. From what I can glean from the website, the house itself looks intriguing as well, with a Women’s Rights room, an Underground Railroad room, a Haudenosaunee Room, a Religious Freedom room, and others. It’s a great chance to learn more about Gage, as well as enjoy a day with great people and focus on the history and future of the Women’s Movement. This entry was posted in Guest Blogger, SBAI Events and tagged #guestblog, #internationalwomensday, #iwd, #matildajoslyngage, #womenshistorymonth. Bookmark the permalink.